Abstract: Misophonia is characterized by a negative reaction to a sound with a specific pattern and meaning to a given individual. In this paper, we review the clinical features of this relatively common yet underinvestigated condition, with focus on co-occurring neurodevelopmental disorders. Currently available data on the putative pathophysiology of the condition can inform our understanding and guide the diagnostic process and treatment approach. Tinnitus retraining therapy and cognitive behavior therapy have been proposed as the most effective treatment strategies for reducing symptoms; however, current treatment algorithms should be validated in large population studies. At the present stage, competing paradigms see misophonia as a physiological state potentially inducible in any subject, an idiopathic condition (which can present with comorbid psychiatric disorders), or a symptomatic manifestation of an underlying psychiatric disorder. Agreement on the use of standardized diagnostic criteria would be an important step forward in terms of both clinical practice and scientific inquiry. Areas for future research include phenomenology, epidemiology, modulating factors, neurophysiological underpinnings, and treatment trials. Although a recent publication showed that subjects with misophonia can have enhanced autonomic reactivity to a sound, but not to other sensory stimuli,7 the subjective experiences described by these subjects following exposure to trigger sounds share qualitative features with the sensory symptoms reported by patients with tic disorders. Moreover, patients with Tourette syndrome often report the phenomenon of site sensitization, in which they become acutely aware of, distracted, and distressed by faint sensory stimuli, which include the auditory modality.34 A study on 28 patients with Tourette syndrome revealed that 70% reported heightened sensitivity to auditory, tactile, and/or visual stimuli, including noise from the television, electrical appliances, and loud settings such as parties.35 A more recent study using standardized questionnaires and in-depth interviews with 19 adult patients with Tourette syndrome and 19 aged-matched healthy controls showed that 80% of the patients described a heightened sensitivity to external stimuli in at least one sensory modality, namely smell (70%), tactile perception (65%), light (60%), sound (55%), and taste (50%). Interestingly, these patients reported that stimuli that were faint, repetitive, or constant and nonsalient were the most bothersome, whereas intense stimuli were perceived as less troublesome.36 Recent reports have also suggested that misophonic symptoms can be found in the context of two of the most common psychiatric comorbidities of Tourette syndrome, in addition to obsessive-compulsive disorder, generalized anxiety disorder,37,38 and schizotypal personality disorder.39,40 Overall, although there is preliminary evidence supporting the suggestion that misophonia can occur as a sole diagnosis, these observations raise the possibility that in some cases, it could also be attributed to underlying neuropsychiatric disorders. Existing literature highlights broad similarities with tinnitus, a symptom that is often considered in the differential diagnosis of misophonia.1–3,6 According to Jastreboff and Hazell, both conditions could share a pattern of increased connectivity between auditory and limbic structures, resulting in heightened reactions to sounds.41 A comprehensive description of this interesting pathophysiological model, including proposed mechanisms by which conditioned reflexes can result in enhanced functional connections between the auditory system and other systems in the brain, particularly the limbic and autonomic nervous systems, has been included in recent publications by Jastreboff and Jastreboff.42,43 However, in misophonia, clinical manifestations are triggered by external, mostly human-produced sounds and situations, whereas persons who experience tinnitus report distress related to internally perceived, abstract sounds. Moreover, it is known that the majority of people can experience general and unelaborated emotional reactions to a range of annoying sounds: among the most familiar examples are the sounds of train wheels on rail tracks, fingernails on glass, or chalk on blackboard.44–46 It is possible that symptoms of misophonia reflect a more extreme subjective discomfort and physiological response to these and other emotionally evocative stimuli. This hypothesis would be consistent with the mentioned overlap with neurodevelopmental disorders, including Tourette syndrome, where sensory hyperawareness accompanied by subjective distress has been reported. The pathophysiology of the anomalous physiological/autonomic effects in the context of misophonia has recently been investigated: a study by Edelstein et al showed increased autonomic responses to auditory (but not visual) stimuli in six subjects with misophonia, compared to typically developed controls.7 Albeit in a small cohort, findings from this study using skin conductance responses provided an objective corroboration to subjective reports that specific sounds evoke intense emotional and physical reactions. Evidence from the pharmacological modulation of the severity of misophonic symptoms might offer some insight on its pathophysiological mechanisms. Alcohol can alleviate the intensity of misophonia, whereas caffeine, a substance known to reduce auditory sensory gating in a paired-click auditory paradigm,47 has been reported to have opposite effects on symptom severity.7 Importantly, these notions are derived from early observations that are to be interpreted with caution until future studies on larger populations have been conducted. Physiological state, symptom, or disorder? The reviewed literature suggests a number of open questions about the exact nature of misophonia. According to the definition originally proposed by Jastreboff, misophonia is not to be considered a pathology or a psychological/psychiatric problem.1–3 Therefore, misophonic reactions could be induced in any person by creating an association between specific patterns and any type of sounds with negative reinforcement: it is enough that certain sounds regularly accompany situations of emotional stress, when the subject experiences pain or other negative emotions (for instance, as a result of hyperacusis or tensor tympanic syndrome, annoyance, anxiety) or beliefs (such as the belief that a specific sound will enhance tinnitus, produce hearing loss, or is produced by a person who is perceived in a negative manner). Real-life examples include the sound of the steps of the stepmother who is following the subject and makes his/her life miserable; the sound of kissing made by a sibling and accompanied by negative comments to irritate the subject; the sound of a train passing by after the subject has been in a car accident where the car was hit by a train; the clicking sound made by the claws of a cat walking over hard surfaces near the subject, who dislikes cats jumping on the table, etc.42 This definition challenges the subsequently proposed views that misophonia is a discrete/idiopathic condition (which can present with comorbid psychiatric disorders)8 or a symptomatic manifestation of an underlying psychiatric disorder, at least in a proportion of cases.4 If confirmed by future systematic studies in large populations, the presence of high rates of comorbidity would go against the argument that misophonia should be labeled as a primary diagnosis. In fact, it would suggest that it is a symptom manifestation of other underlying or comorbid diagnoses and should more appropriately be labeled as a symptom, rather than as a stand-alone diagnosis. Either way, the addition of misophonia to nosographic classification systems of psychiatric disorders, such as the DSM, would require careful consideration. This issue was raised in a poignant way by Ronald Pies in a relevant commentary on the appropriateness of designating Internet addiction as a mental disorder in the fifth edition of the DSM (DSM-V). Pies eloquently argued that in recent years psychiatric nosography proliferated in an unprecedented and apparently unstoppable way, leading the general public to believe that the definitions of psychiatric disorders are settled by “vote by committee” in the academic equivalent of the “smoke-filled room”.52 Needless to say, such a view, albeit possibly exaggerated, can affect public trust in psychiatry to a significant extent. Although misophonia is believed to be far from rare,8,42 this topic has attracted relatively little academic interest to date. Encouraging trends include the First International Conference on Hyperacusis, which was organized by the tinnitus and hyperacusis therapy team of the Royal Surrey County Hospital and held at Birkbeck College (University of London) in 2013.53 This landmark event was followed by a highly successful second scientific meeting held at the same premises in 2015. There is general awareness that further research needs to be conducted before firm conclusions can be drawn with regard to both the pathophysiology and treatment of misophonia. Ideally, a comprehensive research agenda should also encompass epidemiological, phenomenological, and genetic aspects (Table 1). It is hoped that by combining qualitative and quantitative data from large populations, it will become possible to fully elucidate the hidden nature of this intrusive condition and alleviate the distress that it can cause. Gratitude is expressed to the anonymous reviewers for their valuable comments. Jastreboff PJ. Tinnitus habituation therapy (THT) and tinnitus retraining therapy (TRT). In: Tyler RS, editor. Tinnitus Handbook. San Diego: Singular, Thomson Learning; 2000:357–376. Jastreboff MM, Jastreboff PJ. Components of decreased sound tolerance: hyperacusis, misophonia, phonophobia. ITHS News Lett. 2001;2:5–7. Jastreboff PJ, Jastreboff MM. Tinnitus retraining therapy for patients with tinnitus and decreased sound tolerance. Otolaryngol Clin North Am. 2003;26:321–336. Cavanna AE. What is misophonia and how can we treat it? Exp Rev Neurother. 2014;14:357–359. Hadjipavlou G, Baer S, Lau A, Howard A. Selective sound intolerance and emotional distress: what every clinician should hear. Psychosom Med. 2008;70:739–740. Schwartz P, Leyendecker J, Conlon M. Hyperacusis and misophonia: the lesser-known siblings of tinnitus. Minn Med. 2011;94:42–43. Edelstein M, Brang D, Rouw R, Ramachandran VS. Misophonia: physiological investigations and case descriptions. Front Hum Neurosci. 2013;7:296. Schröder A, Vulink N, Denys D. Misophonia: diagnostic criteria for a new psychiatric disorder. PLoS One. 2013;1:e54706. Wu MS, Lewin AB, Murphy TK, Storch EA. Misophonia: incidence, phenomenology, and clinical correlates in an undergraduate student sample. J Clin Psychol. 2014;70:994–1007. Webber TA, Storch EA. Toward a theoretical model of misophonia. Gen Hosp Psychiatry. 2015;37(4):369–370. Jastreboff PJ, Jastreboff MM. Treatments for decreased sound tolerance (hyperacusis and misophonia). Semin Hear. 2014;35:105–120. Hollander E, Wong CM. Obsessive-compulsive spectrum disorders. J Clin Psychiatry. 1995;56(suppl 4):3–6. Starcevic V, Janca A. Obsessive-compulsive spectrum disorders: still in search of the concept-affirming boundaries. Curr Opin Psychiatry. 2011;24:55–60. Reynolds S, Lane SJ. Diagnostic validity of sensory over-responsivity: a review of the literature and case reports. J Autism Dev Disord. 2008;38:516–529. Johnson PL, Webber TA, Wu MS, Lewin AB, Murphy TK, Storch EA. When selective audiovisual stimuli become unbearable: a case series on pediatric misophonia. Neuropsychiatry. 2013;3:569–575. Hazen EP, Reichert EL, Piacentini JC, et al. Sensory intolerance as a primary symptom of pediatric OCD. Ann Clin Psychiatry. 2008;20:199–203. Lewin AB, Wu MS, Murphy TK, Storch EA. Sensory over-responsivity in pediatric obsessive compulsive disorder. J Psychopathol Behav Assess. 2015;37:134–143. Webber TA, Johnson PL, Storch EA. Pediatric misophonia with comorbid obsessive-compulsive spectrum disorders. Gen Hosp Psychiatry. 2014;36:231.e1–e2. Reynolds S, Lane SJ. Sensory overresponsivity and anxiety in children with ADHD. Am J Occup Ther. 2009;63:433–440. Green SA, Ben-Sasson A. Anxiety disorders and sensory over-responsivity in children with autism spectrum disorders: is there a causal relationship? J Autism Dev Disord. 2010;40:1495–1504. Tavassoli T, Miller LJ, Schoen SA, Nielsen DM, Baron-Cohen S. Sensory over-responsivity in adults with autism spectrum conditions. Autism. 2014;18:428–432. Hazen EP, Reichert EL, Piacentini JC, et al. Case series: sensory intolerance as a primary symptom of pediatric OCD. Ann Clin Psychiatry. 2008;20:199–203. Neal M, Cavanna AE. Selective sound sensitivity syndrome (misophonia) in a patient with Tourette syndrome. J Neuropsychiatry Clin Neurosci. 2013;25(1):e1. Cavanna AE, Rickards HE. The psychopathological spectrum of Gilles de la Tourette syndrome. Neurosci Biobehav Rev. 2013;37:1008–1015. Eddy CM, Cavanna AE. Tourette syndrome and obsessive compulsive disorder: compulsivity along the continuum. J Obsess Compuls Rel Disord. 2014;3:363–371. Lochner C, Fineberg NA, Zohar J, et al. Comorbidity in obsessive-compulsive disorder (OCD): a report from the International College of Obsessive-Compulsive Spectrum Disorders (ICOCS). Compr Psychiatry. 2014;55:1513–1519. Rajagopal S, Seri S, Cavanna AE. Premonitory urges and sensorimotor processing in Tourette syndrome. Behav Neurol. 2013;27:65–73. Tinaz S, Belluscio BA, Malone P, van der Veen JW, Hallett M, Horovitz SG. Role of the sensorimotor cortex in Tourette syndrome using multimodal imaging. Hum Brain Mapp. 2014;35:5834–5846. Eddy CM, Cavanna AE. Premonitory urges in adults with complicated and uncomplicated Tourette syndrome. Behav Modif. 2013;38:264–275. Crossley E, Cavanna AE. Sensory phenomena: clinical correlates and impact on quality of life in adult patients with Tourette syndrome. Psychiatry Res. 2013;209:705–710. Crossley E, Seri S, Stern JS, Robertson MM, Cavanna AE. Premonitory urges for tics in adult patients with Tourette syndrome. Brain Dev. 2014;36:45–50. Reese HE, Scahill L, Peterson AL, et al. The premonitory urge to tic: measurement, characteristics, and correlates in older adolescents and adults. Behav Ther. 2014;45:177–186. Kane MJ. Premonitory urges as “attentional tics” in Tourette’s syndrome. J Am Acad Child Adolesc Psychiatry. 1994;33:805–808. Leckman JF, Bloch MH, Sukhodolsky DG, Scahill L, King RA. Phenomenology of tics and sensory urges: the self under siege. In: Martino D, Leckman JF, editors. Tourette Syndrome. Oxford: Oxford University Press; 2013:3–25. Cohen AJ, Leckman JF. Sensory phenomena associated with Gilles de la Tourette’s syndrome. J Clin Psychiatry. 1992;53:319–323. Belluscio BA, Jin L, Watters V, Lee TH, Hallett M. Sensory sensitivity to external stimuli in Tourette syndrome patients. Mov Disord. 2011;26:2538–2543. Khalifa N, Von Knorring A-L. Tourette syndrome and other tic disorders in a total population of children: clinical assessment and background. Acta Paediatr. 2005;94:1608–1614. Conelea CA, Carter AC, Freeman JB. Sensory over-responsivity in a sample of children seeking treatment for anxiety. J Dev Behav Pediatr. 2014;35:510–521. Cavanna AE, Robertson MM, Critchley HD. Schizotypal personality traits in Gilles de la Tourette syndrome. Acta Neurol Scand. 2007;116:385–391. Ferreira GM, Harrison BJ, Fontenelle LF. Hatred of sounds: misophonic disorder or just an underreported psychiatric symptom? Ann Clin Psychiatry. 2013;25:271–274. Jastreboff PJ, Hazell J. Tinnitus Retraining Therapy: Implementing the Neurophysiological Model. New York: Cambridge University Press; 2004. Jastreboff PJ, Jastreboff MM. Using TRT to treat hyperacusis, misophonia and phonophobia. ENT Audiol News. 2013;21:88–90. Jastreboff PJ, Jastreboff MM. Decreased sound tolerance: hyperacusis, misophonia, diplacousis, and polyacousis. Handb Clin Neurol. 2015;129:375–387. Halpern L, Blake R, Hillenbrand J. Psychoacoustics of a chilling sound. Percept Psychophys. 1986;39:77–80. Zald DH, Pardo JV. The neural correlates of aversive auditory stimulation. Neuroimage. 2002;16:746–753. Kumar S, von Kriegstein K, Friston K, Griffiths TD. Features versus feelings: dissociable representations of the acoustic features and valence of aversive sounds. J Neurosci. 2012;32:14184–14192. Ghisolfi ES, Schuch A, Strimitzer IM Jr, et al. Caffeine modulates P50 auditory sensory gating in healthy subjects. Eur Neuropsychopharmacol. 2006;16(3):204–210. Jastreboff MM, Jastreboff PJ. Decreased sound tolerance and tinnitus retraining therapy (TRT). Aust N Z J Audiol. 2002;24:74–84. Bernstein RE, Angell KL, Dehle CM. A brief course of cognitive behavioural therapy for the treatment of misophonia: a case example. Cogn Behav Ther. 2013;6:e10–e13. Beck R, Fernandez E. Cognitive-behavioral therapy in the treatment of anger: a metaanalysis. Cogn Ther Res. 1998;22:63–74. Schneider RL, Arch JJ. 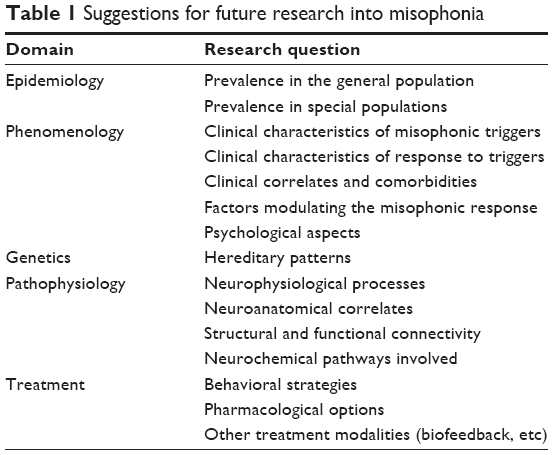 Potential treatment targets for misophonia. Gen Hosp Psychiatry. 2015;37:370–371. Pies R. Should DSM-V designate “internet addiction” a mental disorder? Psychiatry. 2009;6:31–37. Aazh H, McFerran D, Salvi R, Prasher D, Jastreboff M, Jastreboff P. Insights from the First International Conference on Hyperacusis: causes, evaluation, diagnosis and treatment. Noise Health. 2014;16:123–126.